If you look close enough it's not so much a lowercase L as it is a slim uppercase L, but from far away the little L foot disappears, so we'll let this Chinglish pass. 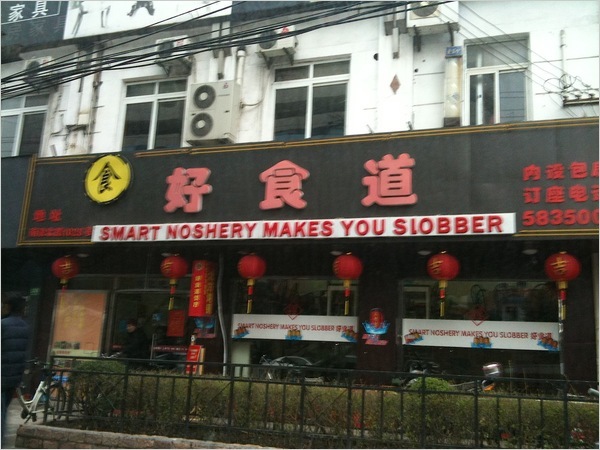 Discovered by Michael A. on NY Times, we can all take comfort in the fact that SMART NOSHERY MAKES YOU SlOBBER. Yeah, I can see a tiny foot on the "L". Probably wouldn't see it from a distance though. And on the subject of Chinglish, this sign smacks of a native English speaker with a sense of humour. The wording is off, true but this feels absolutely deliberate. I only hope that the sign's still in place though. China's waged a bit of a war on Chinglish just lately and while that must be keeping the translation agencies in business, I think it's a bit short-sighted. I don't know about anyone else but if I was walking by and saw this sign, I'd make a point of eating there. "Gourmet Restaurant" just doesn't have the same impact. Not that Chinglish should be allowed to crop up in any situation. Important documentation, safety signs, anything like that should be handled by the professionals. But eradicating it entirely just feels like a massive overreaction to me.